Within the uniquely spicy nose of this IPA is the gentle note of citrus. Adding to that is the subtle aroma of local, Kyoto Matcha, carefully balanced to give you a distinctly Kyoto-feel. While the flavor is mellow and soft, it retains the full-bodied depth of bittering hops, and enjoyable matcha finish. Though it pairs outstandingly with bold cuisine and oily components, because of the matcha used, trying it with tempura, cha-soba, and other foods you might use matcha-salt with, is another great idea. 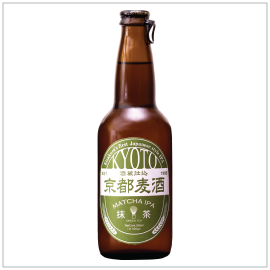 Also available: Kuromame Ale, Yamadanishiki Ale, White Yuzu Ale and Kurano Kahori Ale.